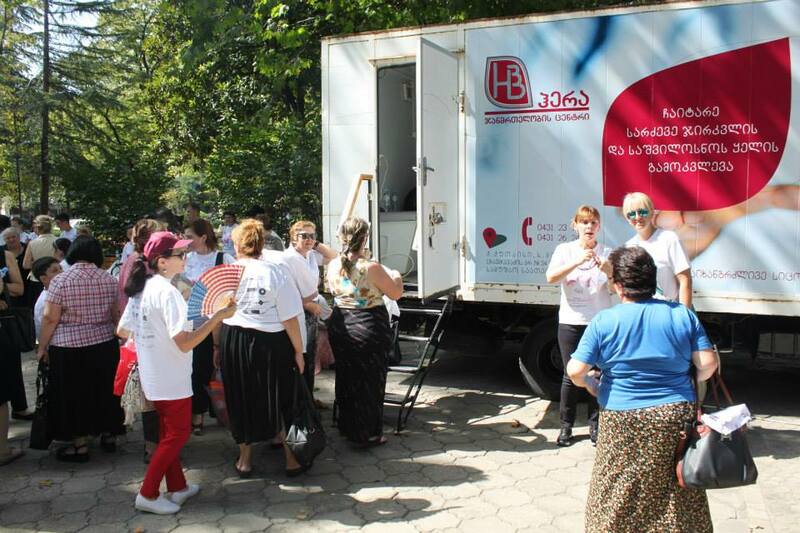 Tbilisi’s 10th Annual Race for the Cure® was held on Sunday, September 20th at Turtle Lake. The event was organized by Women Wellness Care Alliance HERA, its Proud Partners and dozens of additional sponsors. Men, women and children of all ages participated along with large businesses and organizations; medical clinics and hospitals; and community members and representatives from all regions of Georgia. Comprised of a 5K Run & 2K Walk, all who attended received complimentary t-shirts, snacks and beverages; perused free health information; had the opportunity to speak with qualified medical professionals; and interacted and shared stories with breast cancer survivors. To mark the 10th anniversary, team captains were urged to recruit 10 people raising 10 GEL and a suggested minimum donation was 2 GEL per participant. With a record number of registered runners and donations, the event received over 800 GEL from participants. Registered teams included Cancer Fighters; Free Democrats; Peace Corps Georgia; New School of Georgia; MMA Georgia Foundation; Run Club Tbilisi; International Women’s Association (IWA); StC Delta; Georgia Youth for a Better World and Ela Tbilisi. The increasing number of survivors participating in the event is encouraging and an important indicator of the public’s increasing awareness and declining stigma around breast cancer in Georgia. Georgia is one of only 13 countries outside the U.S. to host an official Komen Race for the Cure® event. Please join us in thanking our Proud Partners and sponsors: USAID Sustain; Georgia’s Ministry of Labor, Health, and Social Affairs; National Center for Disease Control and Public Health; National Screening Center; Tbilisi City Hall; BP; ProCredit Bank; Bank Republic; Roche Georgia; Charitable Fund Aversi; Turtle Lake; Winner Women’s Club; Helping Hand; AmCham; Smart; Georgian Events; Holiday Inn Tbilisi; Georgian Bakers; Radisson Blu Iveria Hotel Tbilisi; Borjomi; Gurieli; Coca Cola; Contours Fitness Club; ARDI Group; and Ronny’s Pizza.